This solution lets you easily edit and modify machine translation output using the latest neural machine translation (Google NMT). Furthermore, by storing data with machine translation + human post-editing in the database, you can improve the quality of translations. In addition, you can select not only the Google NMT engine, but also from among a variety of machine translation engines (some requiring a separate cost). Machine translation to date has consisted mainly of rule-based machine translation that translates based on registered rules, and statistical machine translation that registers a large amount of bilingual data (usually called a “corpus”) and generates translated sentences by statistical methods. But, in 2016, Google announced its Neural Machine Translation (NMT) engine based on deep learning. 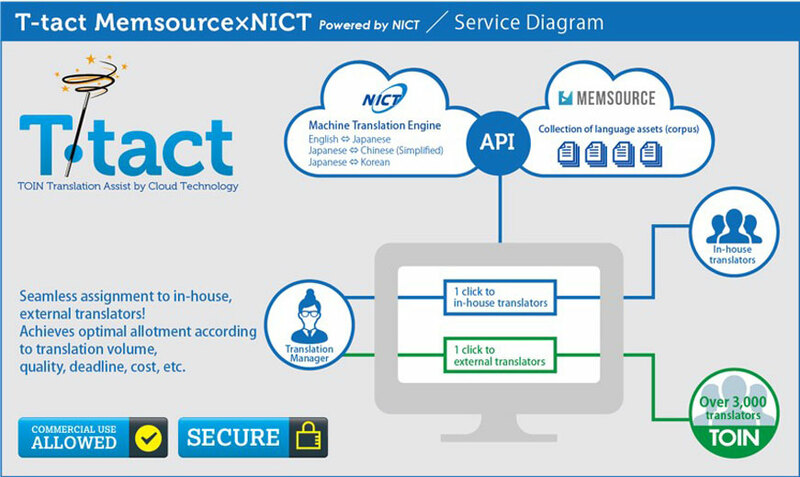 The dramatic improvement in the quality of machine translation has attracted a lot of attention, and the utilization of NMT is expected to improve work efficiency in practical translation. TOIN has been conducting an empirical investigation on improving productivity also, and last year, we announced our results at the MT Summit (International Conference on Machine Translation). By correcting the output of machine translation and storing it in the database, the more the NMT engine learns based on the translation data, so the more you use it, the better the quality becomes. You can also request an experienced professional translator in one stop. 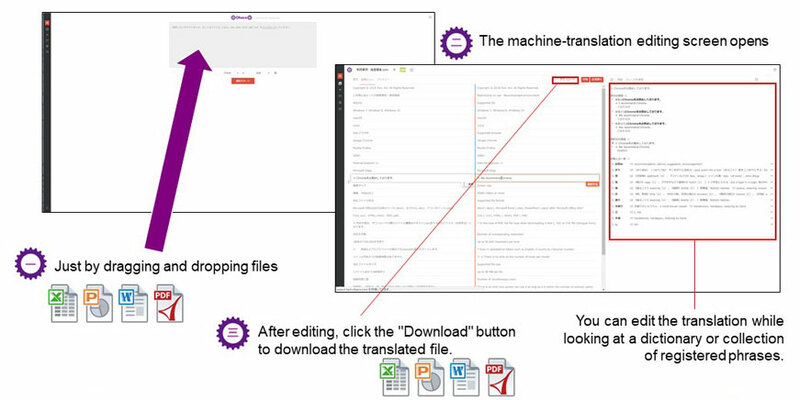 “Machine + Human post-editing” cloud-based translation tool “T-tact Ohaco” accelerates business and achieves dramatic efficiency. What’s more, it will soon be possible to create translation assets for each user and company and to operate it on a semi-permanent basis. Furthermore, users can open the editing screen simply by dragging various files. If you correct the bilingual translation table produced by machine translation and add the corrected table to the database, it will be reflected in the next translation. Also, this solution makes it easy for users to get the translated files. This solution supports Word (.docx), Excel (.xlsx), and PowerPoint (.pptx) formats from Microsoft Office 2007 and later, as well as CSV (.csv), HTML (.html), and PDF (.pdf) files. In the case of PDFs, the file type when downloading will be Word (.docx) files. The solution supports the following 23 languages. Japanese, English, Chinese (Simplified), Chinese (Traditional), Korean, Indonesian, Thai, Vietnamese, Malay, Tagalog, Hindi, Myanmar, Mongolian, Arabic, Spanish, French, German, Italian, Portuguese, Russian, Swedish, Dutch, and Polish. Contracts are only annual contracts. The will be a lump sum payment when service use starts. All amounts exclude tax. For the meaning, grammar, and example sentences using words, you can refer to the Genius dictionary results in the side panel. We can import and export your data in bulk.